Director/Screenplay – Michael Crichton, Producer – Michael Rachmil, Photography – John A. Alonzo, Music – Jerry Goldsmith, Robotic Effects – Broggie Elliott Animation, Robotic Systems International & Special Effects Unlimited, Production Design – Douglas Higgins. Production Company – Tri-Star/Delphi III. Jack Ramsey is a sergeant with the Runaway Squad – a police emergency unit that has been created to deal with amok robots. Ramsey discovers that a spate of near-fatal robot accidents have been deliberately set up and the robots re-engineered with advanced new chips. The trail leads him to wanted electronics genius Charles Luther. When Ramsey obtains the templates that Luther needs for his chips, Luther then comes after Ramsey with his killer robots. Runaway was the fifth directorial outing of Michael Crichton. Michael Crichton first emerged on the scene as the author of novels such as The Andromeda Strain (1969) and The Terminal Man (1972), both of which were successfully filmed as The Andromeda Strain (1971) and The Terminal Man (1974). Crichton then used this clout to make his big-screen directorial debut with the tv movie Probe (1972), followed by the theatrically released Westworld (1973). Westworld was an enormous success and Crichton then went onto direct the likes of the medical conspiracy thriller Coma (1978), the Victorian train robbery thriller The Great Train Robbery (1979) and the science-fiction film Looker (1981). From Looker onwards, Michael Crichton’s directorial outings were only middling successes and after the flop of his sixth film, the courtroom thriller Physical Evidence (1989), Crichton returned to writing books. That was of course until the massive success of Jurassic Park (1993), adapted from his novel, which reinvigorated Michael Crichton’s career all over again. (See below for Michael Crichton’s other films). In almost all of the abovementioned films, Michael Crichton has an obsessive fear of technology going out of control. This is a decided irony as, despite the anti-technology slant, the hi-tech displays and hard research that goes into Michael Crichton’s films and books are often far more interesting than the wooden characters that he uses as representative of the humanity he defends. The situation is rectified somewhat here with strong and believable performances from Tom Selleck and Cynthia Rhodes, and particularly from Kirstie Alley as a sharp-tongued, hard-nosed secretary. Although the one area that casting falls down is in Gene Simmons (once the bassist and tongue-waggling lead singer for seventies glitter super-group Kiss) who plays the role more as a bad-mouthing street-punk out of Hill Street Blues (1981-7) than anything suggesting a scientific genius. Runaway manages a competent bevy of ideas but does seem a little pat at times. There are some neat devices – especially the explosive bullets that can steer around corners. 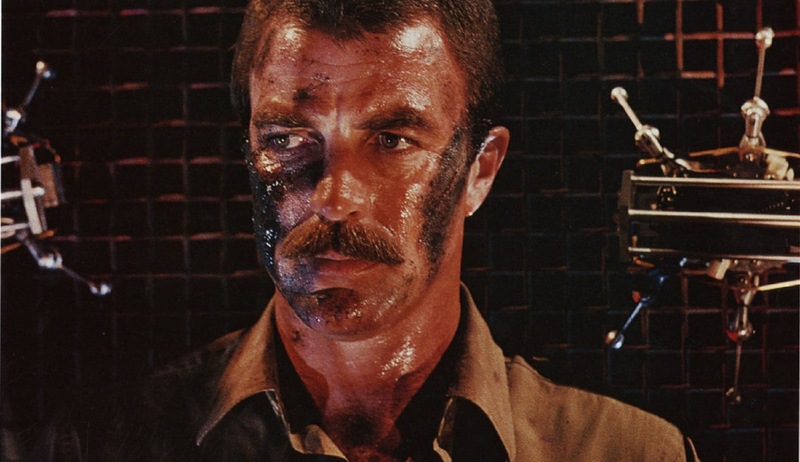 However, many of the points are predictable – one can guarantee the moment that Tom Selleck’s vertigo is mentioned that it will become a crucial issue at the climax. The tearing in half of the templates is such an obvious solution one wonders why someone did not think of it before such a long drawn-out chase. Some of the coincidences rate highly – like how Tom Selleck just happens upon Kirstie Alley being attacked by a runaway file robot while searching for information on Luther. If the robot is a genuine runaway, this strains coincidence; if it was sent by Luther to kill her why does he do so before she delivers the chips? Michael Crichton directs with a fair degree of tension and mounts the climax well, although Gene Simmons has a silly return from the dead scene that feels like it belongs more in a cheap slasher film. Following the success of Jurassic Park, there have been highly successful adaptations of most of Michael Crichton’s books including – Rising Sun (1993), a non-genre thriller from Crichton’s alarmingly racist novel about Japanese business practice; Disclosure (1994), a quasi-sf thriller about sexual harassment; Congo (1995), a modern lost city quest; Twister (1996), a Crichton original screenplay about tornado chasers; The Lost World: Jurassic Park (1997); Sphere (1998), an underrated film about the investigation of an underwater UFO; The 13th Warrior (1999), from Crichton’s Eaters of the Dead (1976), a reworking of the epic legend Beowulf with Neanderthals; the time travel film Timeline (2003); the tv mini-series remake of The Andromeda Strain (2008); and the tv mini-series remake of Westworld (2016– ). Crichton also created the hit tv medical drama ER (1996-2009).